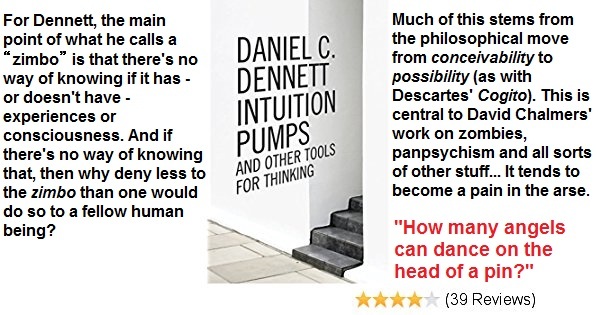 This is a short response to the 'Zombies and Zimboes' chapter of Daniel Dennett's book, Intuition Pumps and Other Tools for Thinking. For Dennett, the main point of what he calls a “zimbo” is that there's no way of knowing if it has - or doesn't have - experiences or consciousness. And if there's no way of knowing that (at least according to Dennett's behaviourist and verificationist logic), then why deny less to the zimbo than one would do so to a human being? If Dennett's zimbo were literally identical - in every respect - to a human being, then how could we say that there's either something less - or something more - to it? And that's because we could - or would - never know that we were actually confronting a zimbo. Though this, of course, is part of the point of the thought experiment: a thought experiment which is itself a response to other philosophers' thought experiments. 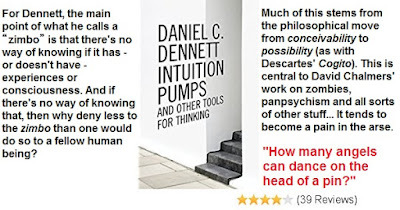 Yet Dennett doesn't like thought experiments in philosophy. Or at least he doesn't like many of them. Many thought experiments can irritate people – even philosophers. Then again, thought experiments certainly serve some purpose. Dennett has a big problem with David Chalmers and his (philosophical) zombies. Many other philosophers and laypersons do too. It all stems from the philosophical move from conceivability to possibility (as with Descartes' Cogito). This is central to David Chalmers work on zombies, panpsychism and all sorts of other stuff. As stated, it tends to become a pain in the arse. Nonetheless, thought experiments have certainly been very important in physics - or at least in theoretical physics. Then again, many historical thought experiments in physics later came to be backed up by experiments, predictions and/or observations. This isn't the case when it comes to (most/all?) philosophical thought experiments; which, almost by definition, can never be confirmed or dis-confirmed. That is, they seem to be designed to have no experimental or observational component. In any case, that's certainly true of zombie thought experiments. "How many angels can dance on the head of a pin?" seems to be more acceptable and productive than some of these thought experiments.